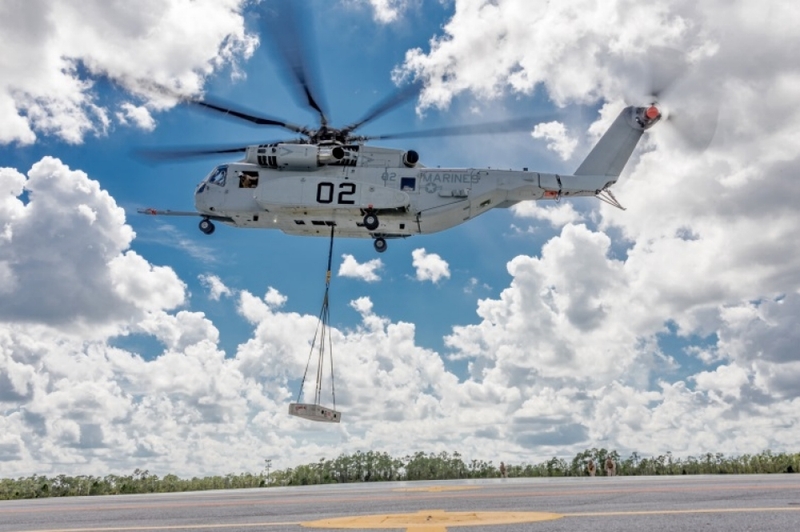 Lockheed Martin announced on October 21 the CH-53K King Stallion successfully completed initial operational testing by the U.S. Marine Corps to verify the key capabilities of the heavy lift helicopter. The week-long operational assessment by Marine Corps pilots, aircrew and maintainers marked an important step in support of a Low Rate Initial Production (LRIP) Milestone C decision early next year. «This successful operational assessment by the Marine Corps is a clear sign of the maturity and the robust capability of the King Stallion», said Dr. Michael Torok, Sikorsky Vice President CH-53K Programs. «This was a key requirement in support of the upcoming Milestone C decision, and its success is another important step in our transition from development into production». The U.S. Marine Corps’ initial operational testing included external lift scenarios of 27,000 lbs/12,200 kg in hover and a 12,000 lbs/5,422 kg 110 nautical mile/126.6 miles/204 km radius mission. Ground events included embarkation/debarkation of combat equipped troops, internal and external cargo rigging, Tactical Bulk Fuel Delivery System (TBFDS) operation and medevac litter configuration. Overall, post evaluation interviews of aircrew, ground crew and flight surgeons revealed a high regard for the operational capability demonstrated by the CH-53K King Stallion. This customer assessment is a pre-requisite to Milestone C and is intended to minimize risk to successfully pass the U.S. Marine Corps operational evaluation (OPEVAL) phase for a future full rate production decision. «OT-B1 (Operational Test) is a critical milestone for the program because this is the first time an operational test has been done utilizing an ’All Marine’ crew», said Colonel Hank Vanderborght, U.S. Marine Corps program manager for Naval Air Systems Command’s Heavy Lift Helicopters Program. «All test objectives were met, and the aircraft performed very well. This further increases our confidence in the design, and is another key step to successfully fielding the CH-53K». The operational testing was based out of the Sikorsky Development Flight Center (DFC) in West Palm Beach, Florida, where CH-53K development flight test is continuing to make excellent progress now with all four Engineering Development Model (EDM) aircraft in flight status. The CH-53K King Stallion will carry three times the external payload of the predecessor CH-53E Super Stallion equating to a 27,000-pound external load over 110 nautical miles/126.6 miles/204 km under «high hot» ambient conditions. The CH-53K King Stallion helicopter provides unmatched heavy lift capability with reduced logistics footprint and reduced support costs over its entire life cycle. CH-53K King Stallion pilots can execute heavy lift missions more effectively and safely in day/night and all weather with the King Stallion’s modern glass cockpit. Fly-by-wire flight controls facilitate reduced pilot workload for all heavy lift missions including external loads, maritime operations, and operation in degraded visual environments. With more than triple the payload capability of the predecessor CH-53E Super Stallion, the King Stallion’s increased capability can take the form of a variety of relevant payloads ranging from an internally loaded High Mobility Multipurpose Wheeled Vehicle (HMMWV) to up to three independent external loads at once which provides outstanding mission flexibility and system efficiency. 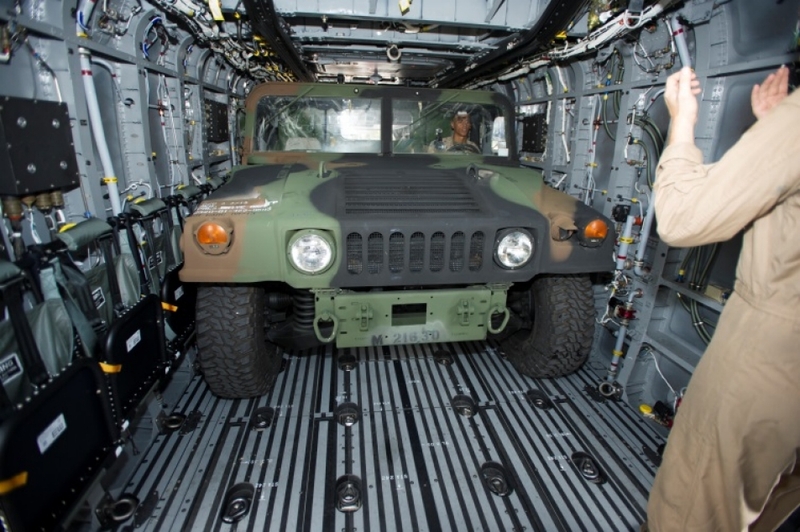 A locking, U.S. Air Force pallet compatible cargo rail system reduces both effort and time to load and unload palletized cargo. The U.S. Department of Defense’s Program of Record remains at 200 CH-53K King Stallion aircraft. The first four of the 200 «Program of Record» aircraft are scheduled for delivery next year to the U.S. Marine Corps, with another two aircraft to follow. Two additional aircraft are under long lead procurement for parts and materials, with deliveries scheduled to start in 2020 The Marine Corps intends to stand up eight active duty squadrons, one training squadron, and one reserve squadron to support operational requirements. This press release contains forward looking statements concerning opportunities for development, production and sale of helicopters. Actual results may differ materially from those projected as a result of certain risks and uncertainties, including but not limited to changes in government procurement priorities and practices, budget plans, availability of funding and in the type and number of aircraft required; challenges in the design, development, production and support of advanced technologies; as well as other risks and uncertainties including but not limited to those detailed from time to time in Lockheed Martin Corporation’s Securities and Exchange Commission filings.